Originally, there were three pagan temples in the Palace. Only one survives and to visit it you must go through the narrow passage ways to the west of the Peristyle. Since space was at a premium inside the Palace, the side streets are very narrow and are often crowded with visitors. 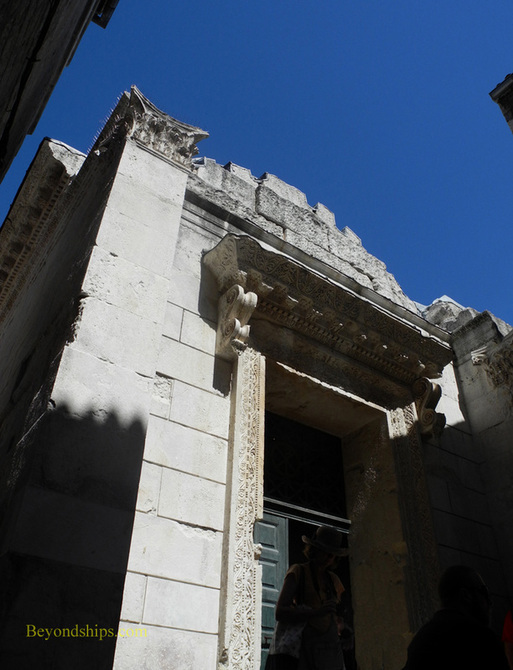 Atop a tall flight of steps is the small Temple of Jupiter, Diocletian's patron god. It was later used as a bapistry. 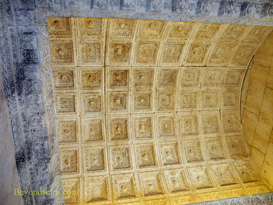 Most of the ancient decoration is gone except for an intricate vaulted ceiling panel. The statue inside is modern but it fits in well with the stark chamber. Above: The entrance to the Temple of Jupiter. Left: A modern statue dominates the interior. Below: The vaulted ceiling. The northern part of the Palace has a more medieval atmosphere. Here, in the gothic-style Papalic Palace is the City Museum. 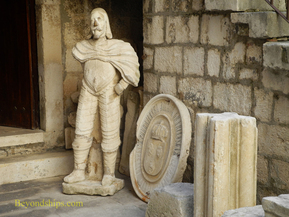 The building was the home of a Croatian nobleman during the Middle Ages. You enter through a gate into a courtyard and then proceed into the three story structure. 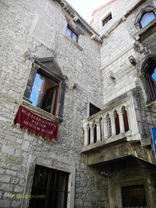 Inside are exhibits with Medieval and Renaissance weapons, furniture and carvings. However, the atmosphere is just as interesting as the contents. Traveling northward through the maze of small streets, you eventually arrive at the Golden Gate. Despite the name, this is not a particularly grand structure. Rather, it is more of a defensive structure consisting of high arched inner and putter gates. Immediately outside the gate is Ivan Mestrovic's giant statue of Gregory of Nin, a 10th century bishop who argued for the use of the Croatian language in the liturgy. The toe of the statue is kept well-polished by visitors as rubbing it is supposed to bring good luck. 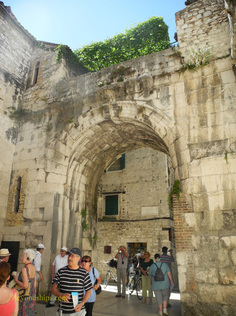 Split eventually outgrew the confines of the Palace. This can be seen immediately to the west of the Palace where there is a section of town with narrow streets, interesting-looking shops and historic buildings dating from the Middle Ages. In the Pjaca (People's Square), there is the graceful old town hall that is now the Ethnographic museum with exhibits showing local costumes and trades. 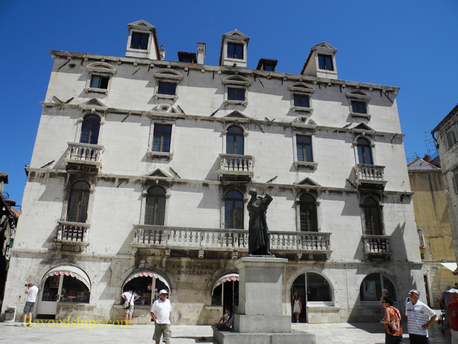 Nearby is the Voćni trg or Fruit Square, so called because there was once an open-air fruit market there. The fruit sellers are gone and instead there are outdoor cafes. 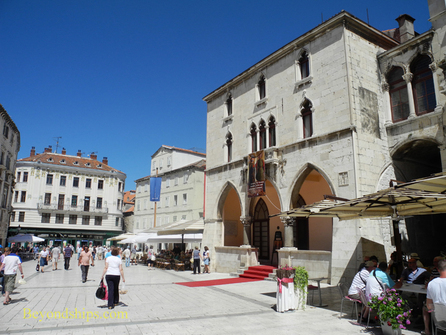 On one side of the square is a Venetian tower (1435) while on the other is the Baroque Milesi Palace. From here, it is only a few steps of the Riva and the seaside. 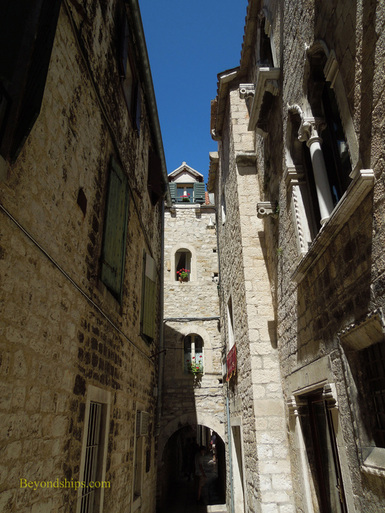 The historic old section of Split has atmosphere. It has more than 1,700 years of history but somehow escapes feeling like a museum. The streets are something of a maze but they are interesting to explore on a sunny Adriatic day as you never know what unusual or picturesque sight lies around the next corner.